Synopsis: “Emma Day and her two cousins, Gretchen and Penelope, are uninterested in their debutante lives. All the boring balls, tiresome curtsying and polite conversation leave much to be desired. Then a girl is found dead, frost clinging to her lifeless body, and the murder is traced to Emma. As their world is turned upside down, Emma discovers more about herself and her cousins, from her connection to the murders to the secrets of her family legacy. Now the girls must embrace their true Lovegrove inheritance in order to stop the chaos, even if that means risking their lives. Dangerously handsome Cormac Fairfax wants to help Emma – but, with secrets of his own to hide, can she trust him? 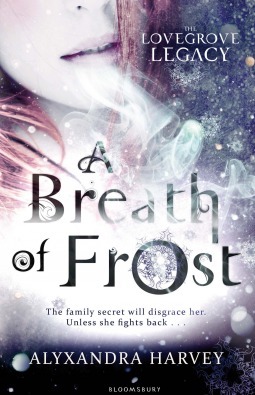 A Breath of Frost follows three cousins around regency London as they learn about their family history and come to realise that everything they once knew about their lives would be tipped upside down. The novel mainly focuses on Emma as she drops a glass keepsake of her mother’s that opens up the gates to the underworld. On the night of their debutante, Emma finds herself being accused of witchcraft and murder by Cormac, a man who she once shared a kiss with. A fire breaks out in the debutante hall and Emma discovers that a fellow debutante froze to death, marked by an odd symbol on her hand. Accused of murder, Emma is chased by The Order whom eventually catches her and gives her a trial (or as close to it as they made it). Cormac, while ignoring Emma, saves her from these accusations by accusing the Greymalkin sisters, three very powerful warlocks that escaped from the underworld due to the gates Emma accidentally opened. Emma soon learns that she and her cousins are all witches from a long line known as the Lovegroves, and they’re all placed in a finishing school made exclusive to witches of upperclass Mayfair. I really enjoyed this first book in The Lovegrove Legacy series, and I’m really warming up to regency novels. A Breath of Frost was full of surprises that kept me hooked to the story. While most of its twists were quite predictable, I still found them enjoyable enough. But it was really the dynamic between Emma and her cousins that made the novel for me. Emma, Penelope and Gretchen are as kickass as you can get when you’re a teenage girl in regency London. Just because they have to run around in full length dresses and corsets that squeeze your lungs together doesn’t mean they aren’t smart all the same. The three of them share a very special bond and would do almost anything for each other. My favourite would probably have to be Penelope as she seems so poised yet is down-to-earth at the same time. Gretchen is seriously feisty, and Emma is smart. Unfortunately, Emma often gets blindsided by her emotions for Cormac. Luckily, there was no love triangle and I really enjoyed the interactions between Emma and Cormac. As they’d already developed feelings for each other prior to anything that happened during the novel (in other words, they had a history), there technically wasn’t any insta-love involved. Hallelujah! The main theme revolving around this book is the idea of love and relationships. Emma and her cousins obviously share a strong bond, but I really loved the relationships between Cormac and his five sisters. Being the only one with no magic in his family, Cormac finds himself constantly being looked after by his younger sisters. They’re all extremely protective of him and consistently turns up to help. The most complicated relationship was the one shared between Emma and her mother, who went mad following a spell that tainted her Lovegrove name. Their relationship is complicated, but also pivotal to the main plot of the story. I thought what her mother did was beautiful, and loved reading the little glimpses we were provided of her past. This theme of family and relationships really provided the novel with that extra bit of oomph. Unfortunately, the downside to this novel is that there were a lot of unnecessary pages. It’s a rather thick book, and I definitely enjoyed reading it, but there were times when I thought that certain stuff could have been left out or done differently to move the story along. Overall, I thought it was a great start to the Lovegrove series. I’m very excited to read the next installment, which I believe features Gretchen! Yay! Thank you to Bloomsbury Australia for sending a copy in exchange for an honest review!